Chevie Diner Booth represents a fully upholstered booth featuring a “V” shape Headroll with 11 vertical channels at 4″ centers. This very popular retro booth was designed to evoke a 50’s nostalgia for the vintage auto. This model has proven to be one of our most popular sets! As pictured, this set is upholstered in Ocean and Chalk vinyls with coordinating Table Top with 1.25″ real metal banding and a Classic Chrome Column Base. 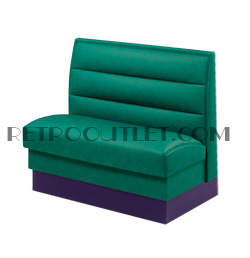 Please allow 4-5 weeks for production of your booth in your choice of upholstery!